My regular acidjazz/nujazz readers can skip this entry. Nothing for you here this time. You have been warned. The first album I bought with my own money was by City Boy - The day earth caught fire. I blame a friend's older brother for this taste in music. I was more into disco really. This was in 1979 I think. 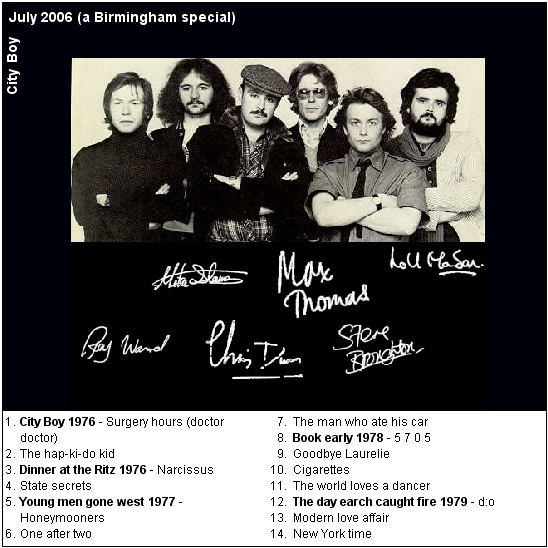 The style is progressive rock, from Birmingham, England. I still like this album, and yesterday bought the albums City Boy, Dinner at the Ritz, Young Men Gone West and Book Early. I may have them on vinyl somewhere but of course I need them in digital form. More information at the City Boy fan page. Plenty of info and also some texts from band members. Max Thomas talk about the very early years is a good read. Excellent fan site. MP3 sound bite (3.1MB). 20 seconds from each song. Cover shot: the band, taken from the fan page. Signatures provided by Dag Young (as shown on the band's unofficial fan site). Content updated 10 March 2019. <URL: http://www.boralv.se/blog/?id=1152809796>. This server is able to calculate 27.9 pages like this per second. No computers were harmed in the making of this page. CSS Validator, HTML Validator.